If you’ve read my blog for a while now you probably know I’m not the biggest fan of veggies. I like them okay but they’re definitely not my meal of choice. For this reason whenever I come up with a new recipe I try to figure out a way to get in as many vegetables as possible. This recipe is no exception! Full of plant protein and healthy carbohydrates from vegetables, this meal definitely gets you multiple plant servings in one meal. I also used my secret trick of adding tons of spices to make the veggies taste even better! 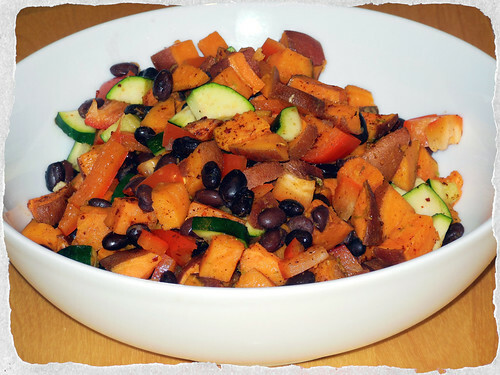 Dice your sweet potatoes in small cubes and place on a baking sheet sprayed with olive oil. ***Little tip for crispier potatoes, soak the raw potatoes in water for 30 minutes. It removes some of the starch and makes them crisp up better. I learned this tip from the Detoxinista! Bake the sweet potatoes for 40-45 minutes until roasted. 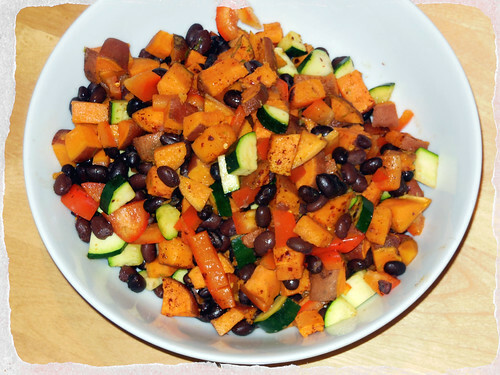 While the sweet potatoes are cooking dice the zucchini and bell pepper into small pieces. Once your potatoes are done preheat a skillet with a tsp. of olive oil. Saute the zucchini and bell pepper until cooked over low heat. Add in the black beans and zest your lime over the mixture. Next add in your spices followed by the sweet potato and continue to saute over low heat. What’s your favorite way to spice up your vegetables??? 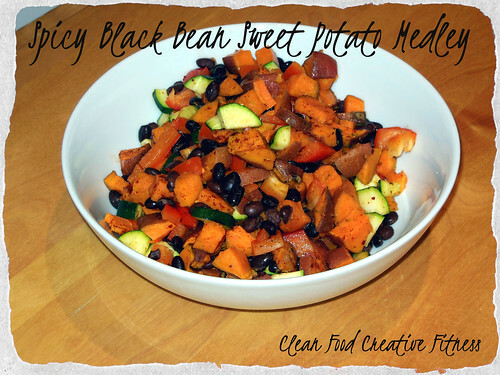 This entry was posted in Recipes and tagged gluten free dinner, gluten free recipe, recipe, spicy, sweet potato, vegetarian on February 22, 2013 by danielle.